I think I was just departing Nepal when I last emailed. From there we flew into Bangkok, knowing that red wine is expensive in Thailand I made sure I made the most of the free wine on the plane. It was so tasty I had a whole bottle – nothing’s changed there then! We stayed in Bangkok for nearly a week sorting out visa’s, visiting temples, going to see floating markets that were just a big tourist trap, and also paying a visit to the Bridge over River Kwai. I think we would have enjoyed the trip a lot more had we not spent most of the previous night in a bar working through the list of cocktails! Needless to say we spent most of the time asleep on the bus. From Bangkok, we boarded the night bus to Champon and then straight onto a boat to Ko Tao which is just one of those run of the mill Thai exotic islands. We headed across the island to a very quiet secluded beach (well, obviously not quiet once we landed) and checked into a straw hut on the beach then bumped straight into Anish and Simon, a couple of fellow backpackers who we met in India and then again in Bangkok. I think they had gone there to escape us as it is not a very well known place on the island. They made up some excuse that they had just checked out of their hut and were just on their way to meet us at the harbour – the hut they checked out of was the one we were allocated! Luckily they had another one for rent in not as good a location so the boys had to settle for that! Anyway, I’ve been doing loads of snorkelling – there’s just loads and loads of really good fishes here, it’s fantastic. I’ve been in the water so much I think I’m going to sprout fins. The bay where we were staying was really nice too, very beautiful and the only mod cons were electric from 6pm -midnight. No shops or anything -bliss! I’m not looking very hot at the moment after deciding to sleep the last 2 nights on the beach, I now look like I have a very bad case of measles. And yes comments about being able to play dot to dot on my face have not gone unnoticed. But it has been worth it, waking up to beautiful sunrises on the bay. We have now moved over to the busier part of the island so I can go diving tomorrow. I’m very excited and have even managed to wangle some free accommodation through the dive centre. Next we move onto Ko Pha Ngan, the next island, just in time for the full moon party which will be more funny than anything else. Can’t see that I will be doing much moon worshiping but it will be amusing to watch others. Diving in Koh Tao was good. I didn’t get to see sharks or turtles as requested, however, I did swim (obliviously) right into a trigger fish despite being warned by the dive master to stay clear! I luckily avoided the attack but then cut my foot open when jumping off the boat back at shore. We’ve been a right pair of invalids as Lesley managed to secure a nice dog bite the previous night and has since fallen down trekking. The next day we got a ferry and bus back to Bangkok and I managed to get my wallet stolen again – just after replacing my credit cards! From Bangkok we took the easy travel option and flew to Chaing Mai, North Thailand. From here we went on a 3 day trek in the wilderness staying in hill tribe villages along the way. The 2nd day was a killer, hiking up and down mountains for 7hours – this has left me aching all over and I plan on indulging in a Thai massage. The elephant ride on the trek was quite amusing as the elephant man resembled a character out of the TV show Monkey Magic and he was off his tree from all the opium he was smoking. It was quite funny to watch him attempt to stay on the elephant and had a few near misses. On the last day of the trek we went rafting down the river on bamboo rafts which I managed to break. The rafting was not quite as exhilarating as the rivers in Nepal but I had quite a good time having water fights with my fellow rafters. Since being back in Chaing Mai we’ve been to see some Thai boxing which isn’t really my cup of tea. I was quite shocked to find the contestants getting younger and younger until a pair of eight year olds were up on stage beating the living daylights out of each other. glad to be able to take some food and toiletries in for them as they get no money whatsoever and are not allowed to work there. However, they were saying that the Thai prisoners only get 100 baht (about 1.50 pounds) for 6 months work! Soon we will be boarded a bus for Chaing Rai, from there we may pop into Myanmar, formally known as Burma then into Laos. 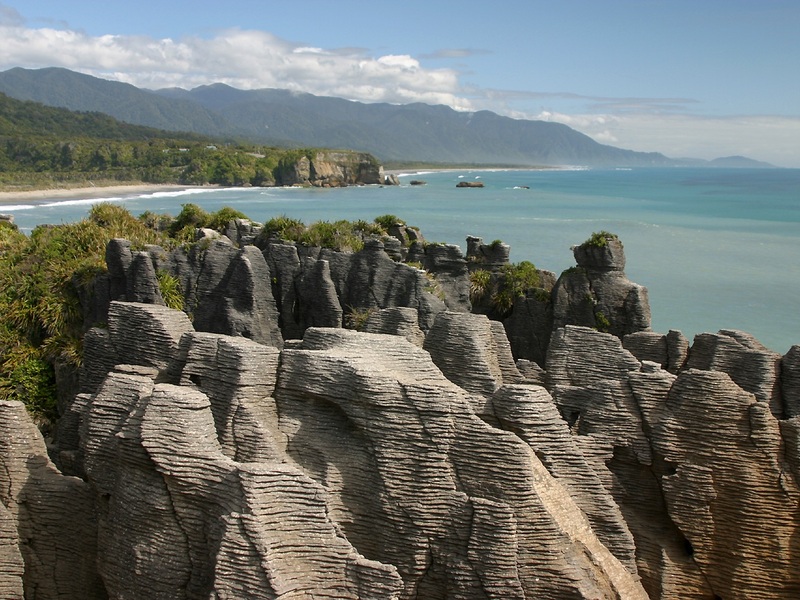 Everybody raves about the south island of NZ…and now I know why! My last few days in Australia were spent where it had all started five months ago – Sydney. My third time there and I still love the place. After catching up and saying farewells to good friends (oh and having the first bath I’ve had in months while staying at the lovely Vic and Rick’s new abode), I leave on a jet plane to NZ’s capital city – Wellington. It is known as the windy city, however, nothing quite prepared me for the icy cold gale force winds that very nearly sent me flying on exiting the airport. I was informed that a southerly had blown in, a southerly being a wind direct from the Antarctic. I didn’t really care where it was coming from, my first instinct was to jump on the first plane outta there. I must admit after ten months in hot climes, I have turned into a bit of a wimp! But no, I persevered and glad I did. Wellington turned out to be a nice city and made even more welcoming thanks to Dawn & Craig’s hospitality. After another shopping spree to buy yet more fleeces, I board a catamaran to cross over the Cook Strait through the majestic Marlborough Sounds to the south island. My first stop here is Nelson, the platform for the beautiful Abel Tasman National Park that hugs the north west coast. Apparently, Nelson also records the highest sunshine hours in NZ. If this is true then I’m in trouble ‘cos all it did when I was there was piss down with rain (excuse my French). With the sea kayaking trip cancelled due to rain. I brave the elements and go off tramping for the day. Great stuff! What Abel Tasman looked like! 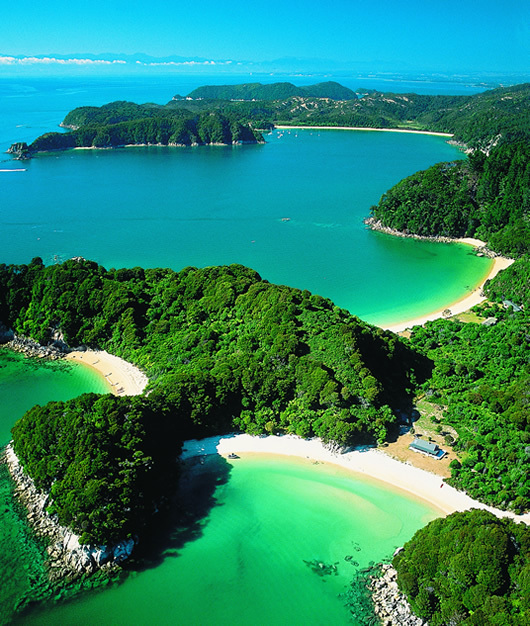 What Abel Tasman SHOULD look like! From there I travel down the wild west coast stopping along the way at an abundance of scenic spots. Also paying a visit to the Cape Foulwind (yes it really is called that and those who have been there will know why!) 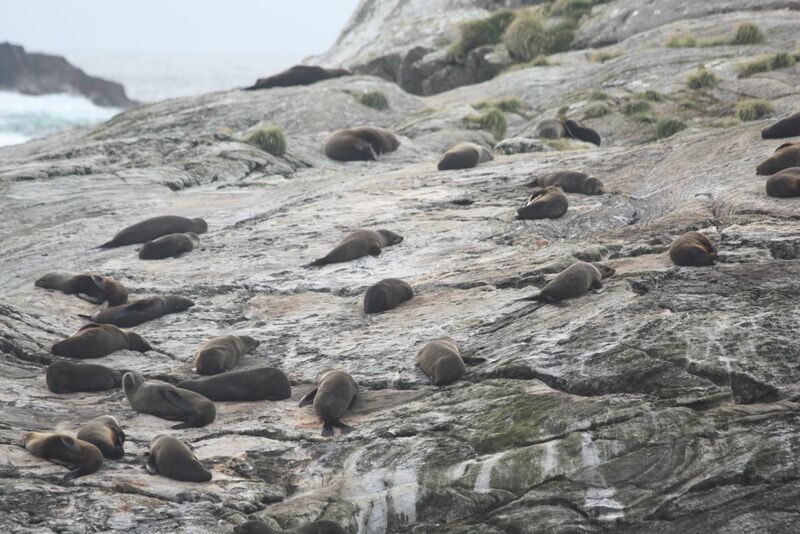 where a seal colony can be found. While here I tried out a new activity. Not a clue what it is called but involves a wind sail attached to a go-cart on the beach and is a lot of fun. The wind allows you to get quite a speed up, oh and did I mention there were no brakes!!! Also stopped briefly at Punakaiki’s famous pancake rocks. A night spent in Greymouth and the next day passing through Hokitika (known for it’s jade) and stopping briefly at the historic gold mining town of Ross to try one’s hand at gold panning, leaving there non the richer I head to Franz Josef. Absolutely freezing and guess what? Yep, raining again, meaning heli-hike’s cancelled. But I arrive just in time for half a day hiking on the infamous glacier. Such an incredible experience walking up sheer faces of ice, through ice crevices and caves, obviously with the help of ice talons on my boots. Superb and I’d definitely recommend it. From here the scenery just gets better and better – if that is at all possible. Lots of fantastic lakes and from now on down snow capped mountains as a backdrop, the snow has been advancing daily down the mountains getting ready for the ski-season – Bring it on! Crowded House’s song “Four seasons in one day” comes to mind when attempting to describe the weather here. Literally one minute blue skies and sun, next hailing and snowing, then gale force winds then nice again! Set on the beautiful shores of Lake Wakatipu, I arrive in the adventure capital of the world – Queenstown. Any adrenalin junkies dream destination. Every extreme activity you can think of can be done here and many more that I had never heard of. Unfortunately, my finances are not the healthiest so I had to be selective in what I did. 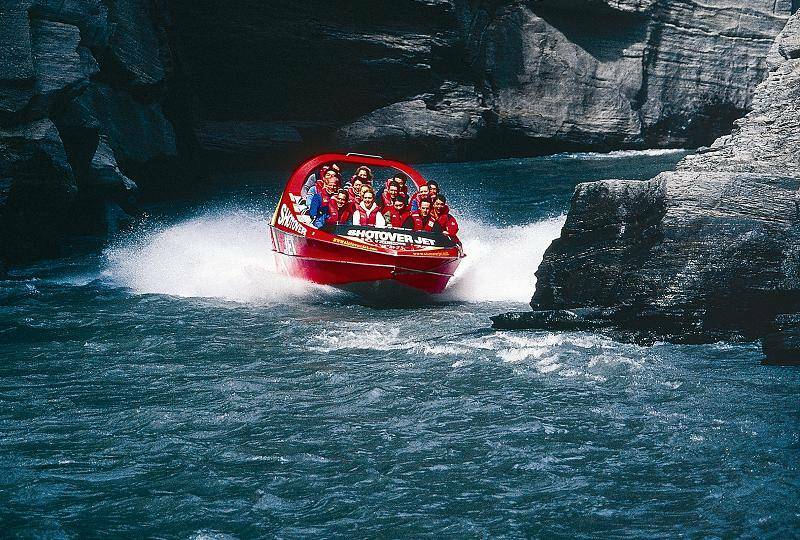 I opt for a package consisting of a jet boat ride on the Shotover River through a canyon complete with 360-degree turns – Exhilarating and definitely a must! From here I get picked up by helicopter that is just the best ever form of transportation ever invented. Fantastic. A scenic flight over Queenstown before landing down on top of a mountain. It is here I experience ludging (sort of like a go-cart) down a steep track – Very good! After playing around in the snow for a bit I took the gondola back down to Queenstown to sample the local beers and check out the local lively nightlife. Today I’m having a day off in Queenstown and guess what? Yep, it’s raining! But that’s OK as it is nice and dry in the bars! Well that’s enough travel talk for one day. Landed in Singapore with a bump. Had a complete culture shock being back in civilisation after however long in developing countries. This place is unnaturally clean and organised. However we soon felt more at home when we checked into what has to be our worst accommodation yet. Singapore’s equivalent of Tower Hamlets full of down and outs, unpleasant aroma’s and bed bugs. The first thing I do here is visit their very posh state of the art post office to collect replacement credit cards and where better to test that they are working than Orchard Road. This is a very bad move as Orchard Road is a cross between Oxford Street, 5th Avenue and Rodeo Drive needless to say I made several purchases to add to my now 28kg load. I eventually dragged myself away to have some goodbye beers with Lesley who is returning home for all that great weather we have been hearing about. ***Watch out everyone Chrissy is now at large in the world on her own!!! *** The next morning we say our farewells, I am very hung over and as a result I do not get very far! The plan was to get to Sumatra but I only manage Batam, another Indonesian island on the way. Here I treat myself to a luxury room with sky TV costing me an extravagant 3 pounds but well worth it. When I do eventually hit Sumatra my first stop in in a very pretty mountain town of Bukinniggi where I met a group of Indonesian teenagers who invite me to go camping with them so they could improve their English – til the early hours, I might add! I found it more tiring than relaxing. I also was asked to mark English presentations at the local school which was different. At the local bullfight I get a bit cocky and go and stand quite close to the two interlocked bulls that haven’t been up to much in the previous 5 minutes, unaware that one is about to bolt right in my direction. I do believe I became a contender for the worlds fastest runner in flip flops. Sumatra is yet another place to add to my list of favourites. Again Stunning scenery and houses with roofs shaped like buffalo horns. In addition West Sumatra is a matrilineal society where all wealth is passed down the women’s line – the woman rules! At last a sensible society. But it is also a muslim society so bit of a contradiction there and not sure who really wears the trousers. A 20 hour journey on a minibus with three winging English guys who I feel like killing was needless to say not the most pleasant journey but worth it to get to my next destination – Danau Toba. Lake Toba occupies the caldera of a giant volcano that collapsed on itself after a massive eruption over 100,000 years ago. Flooding of the subsequent crater produced the largest lake in SE Asia. In the middle of the bluey green expanse of H2O is Pulau Samosir, and island nearing Singapore in size. It is here that I rent a lakeside bungalow for about 80p a night and spend the next few days relaxing and recovering from the long journey. I hire a moped to explore the island planning to have a nice soak in the natural hot springs. This plan was abandoned after I painfully found out with my foot that the water was more a boiling temperature than hot! On the way back the heavans opened for the daily afternoon monsoon. I stop in a small village for shelter and ended up inviting myself to play dominos with four local farmers. Eventually I leave the tranquility of the lake to travel up to the small village of Bukit Lawang, situated on the fast flowing Sungai Bohorok river and on the edge of the Gunner Lesser Jungle. Here is home to the dwindling number of Orangutan’s which were amazing to see up close and quite similar to the homo sapien (well at least a few of the one’s I know). While walking through the jungle I also saw close up a lot of monkeys but I have learn’t my lesson with monkeys and this time did not stick around to allow them to attack me. After a couple of days here I head to the stifling capital of Medan, stopping just long enough to get a ferry outta there to Penang, Malaysia. I will miss Sumatra, especially the prices. While England is having a fuel price crisis, a minibus can be filled with fuel in Sumatra for around a pound – outrageous behaviour! Accommodation as cheap as 50p a night (for double room), meals for 50p, do I need to go on? Unfortunately, Malaysia, being quite developed, is a tad more expensive. In Georgetown, I stayed in the Little India part of town where you can find the best Tandoori chicken – yes, my days of vegetarianism have come to an abrupt halt! A colorful Hindu Temple on the streets of Kuala Lumpur, Malaysia. After the sights of Penang I hop on a bus to Cameron Highlands, as the name suggests a mountainous area where I stay in what has to be the maddest hostel around. Set up in the hill above the small town of Tanah Rata are several Anderson shelter look-a-likes left over from the British army. These have since been converted into a hostel where you find a selection of crazy characters. I arrive to find a party around a camp fire going on, the proprietor Bob, who was half cut, shows me and someone else around telling us several times that only happy people can stay and if we are not happy then he’d drive us back into town. We tell him it is fine but he won’t let us stay until he has shown us everything and introduced us to everyone which took over 10 minutes! One couple there came 20 months ago and have not yet left! Anyway after a very cold night I go trekking with a couple of guys who turn out to be just as pathetic as me at finding the start of the trek, not a hard feat when we had a clear map and it was only about a 5 minute walk from our accommodation! Eventually we found it and trekked for 4hrs working up an appetite which was satisfied by yet more delicious indian food in the next town. From the highlands I head to Kuala Lumpar (KL) which is another shoppers paradise and home tothe infamous twin towers (apparently the tallest buildings in the world). I didn’t hang around there long for fear of going shopping so left the next day for Melaka, Malaysia’s most historic city. I will stay here a few days before heading back to Singapore to catch a flightto Bali. There’s a new waterpark down the road so may try that out tomorrow. From Chaing Mai to Chaing Rai, still Northern Thailand. We then headed to the Golden Triangle where Thailand, Burma & Laos meet, an area renowned for its opium production. The opium museum being quite an eye opener! Time was getting on and we managed to miss the last bus back to town so hitched a lift in a pick up truck with a Thai family of 16. Bit of a tight squeeze but more comfortable than the bus with all the fresh air you could ask for. The next day up early to make our way across the border (the mighty Mekong river) and into Laos. The only way to our next destination is via the waterways – 2 days on a boat down the Mekong. Absolutely beautiful scenery passing through hillside villages with huts of straw – just a shame the boat was the most uncomfortable boat in the world. Packed to the brim of people, crammed into a small space like sardines, sat on the slimmest wooden plank, head almost touching the roof, no leg room, I think you get the picture. After two days you get to know your fellow passengers very well. Pleased to be off the boat we stretch our legs exploring Luang Prabang. I made friends with a couple of the Lao street vendors – two really sweet old guys who smelt like they were a bit partial to the odd whiskey if you know what I mean. One of them sold tiny bags of wood chips – very bizarre. I attempted to find out why people would want to buy a 2 x 5cm bag of wood. This was slightly a difficult task as he did not speak a word of English and me only being in Laos a few days have not yet mastered the Lao language. Needless to say we resorted to body language and from what I could ascertain the wood is soaked in liquid which is then used as medicine, different woods used for different ailments. His mate on the next stall had put his wood in his whiskey and was insistent that I have some as it would make me strong! I reclined the offer telling him that alcohol has many affects on me but it certainly doesn’t make me very strong. From Luang Prohbang we went on a day trip stopping first at a local village then onto an absolutely superb waterfall with the best plunge pools to swim in. I climbed to the top of the waterfall for a great view while Lesley sunbathed at the bottom after she decided that she is allergic to any form of exercise! Onto Vang Vieng, again passing through great scenery. Laos is another beautiful country reminding me a lot of Nepal. Vang Vieng was supposed to be a stop off place to break up the long journey to Vietiane, however it was so nice we ended up staying a few days. The small town set on a river hosted the popular activity of tubing. Those of you who I was in the Middle East with will know what I mean. 2 hours floating merrily down the river on large inner tubes – good fun! There was also some great caves in the area which I explored, one being 2km long and another hosting a big pool at the end of the cave to swim in. From there sadly onto our last destination in Laos – Vietiane. Set again on the Mekong river. Quite a relaxed small place for a capital city. Today we have done the sites, the usual Vats and Stupas with a festival occurring at one of the sites. We then took a trip out of the city this afternoon and I got attacked by an albino vicious monkey – the cheeky little thing and he looked so cute. Tomorrow we leave on a jet plane to Nam – Vietnam. Flying with Lao Aviation – renowned for being one of the worst airlines in the world with a very bad safety record. Apparently due to the lack of equipment the pilots rely on visual flying techniques and search for a hole in the cloud in order to descend! If no hole found then it is back to departure point to refuel and try again!!! When asking the guy who sold us the flight ticket if they were safe he just laughed and said he wasn’t allowed to say negative things about Lao Aviation. Talk about instilling confidence. Lets just pray that there’s clear skies tomorrow. Anyway, I’ll be charging around Vietnam as a lot of mileage to be done so may not be able to email for a while. An aerial view of Moslem-occupied West Beirut and the Mediterranean shoreline. Buildings throughout the city have been damaged by shelling during ongoing confrontation between Israeli forces and the Palestine Liberation Organization. Now sat in an internet cafe in Beiruit after the tour of war torn buildings etc – quite harrowing but good to see if you know what I mean. have been picking up. In case you don’t know Syrians do not get on with the Israelis and you are not allowed into syria if you have been into Israel. I loved the dead sea – doesn’t taste too good though as I found out when having a water fight. Also been to more Roman ruins which are beginning to get a bit tiring after seeing so many. Now off to the beruit seaside for an ice cream.